A good old fashioned one this week. Hide and go seek. I played this game as a child and played it with the children I taught when I was a teacher, but it was only through my learning at the Tavistock and Dr Solter's work, that I truly saw the deeply healing effect this type of play has on children. If you child wants to play hide and go seek or any separation type of game, such as peek a boo or hiding under a blanket etc etc, I would stop and play. It is their way of saying they need to connect with you, and find ways to heal from perhaps separations they have experienced both from the present and the past. The beautiful thing about Attachment Play, is once you see deeper into children's play requests, you will notice that it is their way of working through issues or stresses they have in their lives. My 2 often initiate hide and go seek before bed. I have loved seeing how the game has evolved over time. My youngest wouldn't hide without me when little and then wouldn't hide without her sister and now will hide on her own. My eldest still finds transitions difficult which can be linked to separations and playing these games at other times can help at a time of transition. The idea as usual is to have lots of laughter. If your child laughs, the game is not only fun but also has a healing effect. 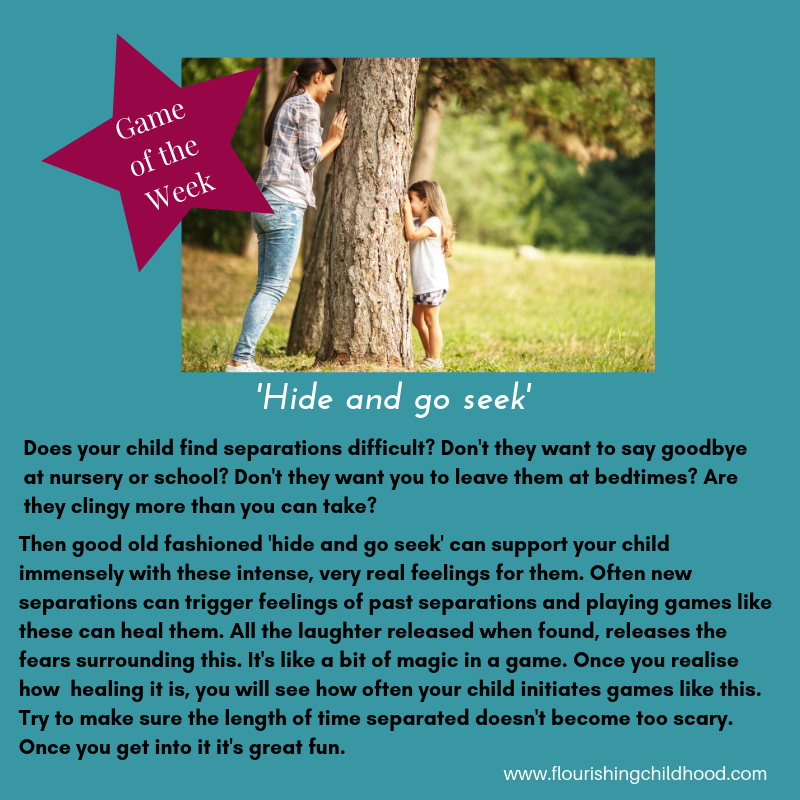 I know by bedtime we are often so tired playing a game is the last thing on your list, but in fact this can be extremely helpful if your child resists going to bed or finds this separation difficult. It could actually help relax your child so they can sleep more easily and for longer. Separation is such a huge thing for babies but we forget that this continues to be a huge emotional stress for children and any new separation can trigger past stressful feelings of separations. I wonder if you can be open to your child's game invitations this week?